Depicting the wise men that have come to pay homage to the newborn Christ child, “The Adoration of the Magi” was designed by Edward Burne-Jones (1833-1898) and produced by Morris & Co in 1887. “The Adoration of the Magi” shows the superb design and attention to detail that’s so distinctive of work of Morris & Co. The attention to detail is exceptional. The richness in the garments, the foliage background, and even the twigs of the stable, brings the entire scene brilliantly to life. The bold use of color enhances the beauty of this work tremendously. Morris & Co was renowned for their distinctive decorative arts, in an increasingly industrial Victorian age, and this piece is a testament to their superb artistry. 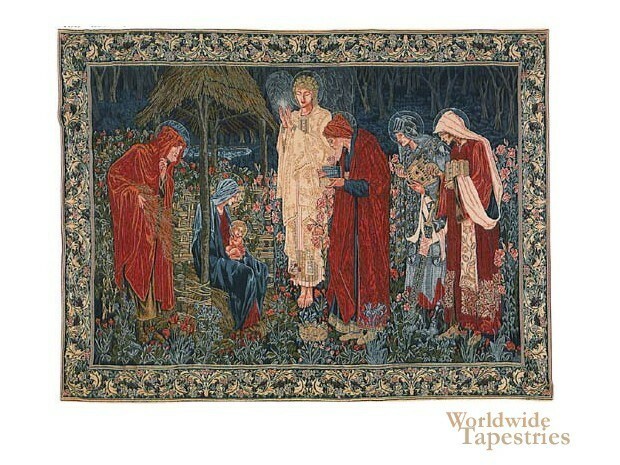 This tapestry is a beautiful reproduction that is faithful to the original, and is lined and has a tunnel for easy hanging.